Before I’d even got out of bed this morning, two kind friends had already messaged me, in congratulatory tones, to say that a cure has been found for Type 1 Diabetes. No, I wasn’t dreaming – but irresponsible and misleading headlines in quality newspapers that should know better were announcing the cure as if it were a fait accompli. Jaded by previously false reports, I wearily messaged my friends back to say that I wouldn’t believe it until there was further clarification, as I doubted that it could really be true. I didn’t need to wait long to have my doubts confirmed. Tuning in to BBC Radio 4’s Today programme, presenter Justin Webb (whose son has Type 1 diabetes, so knows about these things) interviewed someone from the JDRF, the leading charitable funder of the search for better therapy and a cure. “It can’t really be true, can it?” he asked tentatively. Sadly, the JDRF person agreed. What has happened is that a major breakthrough has been made by Professor Doug Melton of Harvard University in stem cell technology. It could – eventually – be a vital piece of a huge jigsaw in making a cure available, but it has not yet been tested on people, and even when it has been, it doesn’t spell an instant cure. Even should a cure become technically possible, it doesn’t mean it will be universally available or affordable. I understand that the newspaper industry is having hard times. It needs to sell papers. And it needs appealing headlines to sell papers. But it is heartless, thoughtless and destructive to emblazon such misleading headlines on the front page. It’s not information, it’s misinformation. The majority of readers won’t have read to the end of the piece, where tucked away on the second page, it is finally stated that a cure may still be many years off. Not only has it misinformed the masses, but it’s also upset those with Type 1 diabetes and their families, by creating false hopes only to dash them again. It will take time to undo that damage. 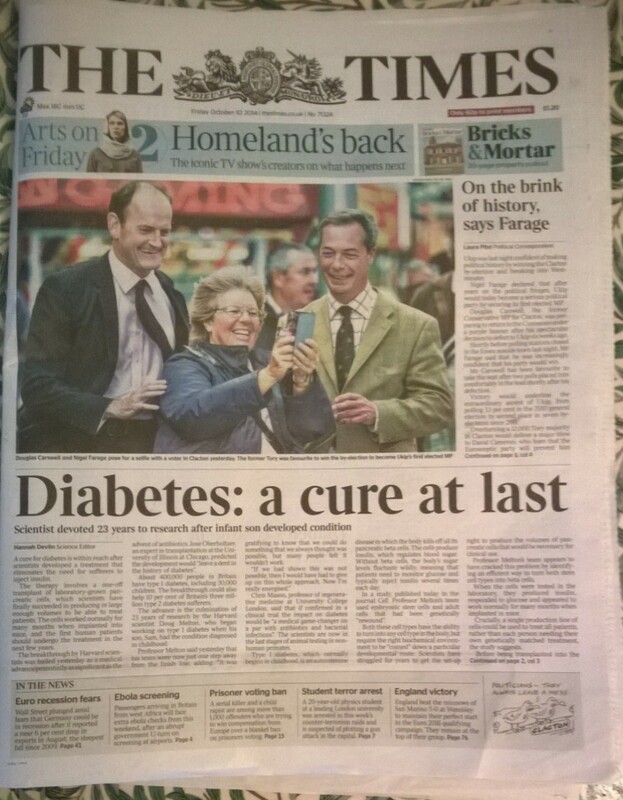 So, to be clear – no, there is no cure for Type 1 diabetes – yet. Much more funding and research is needed to get us there. But there is hope, provided we keep raising money for research and raising awareness of the need. 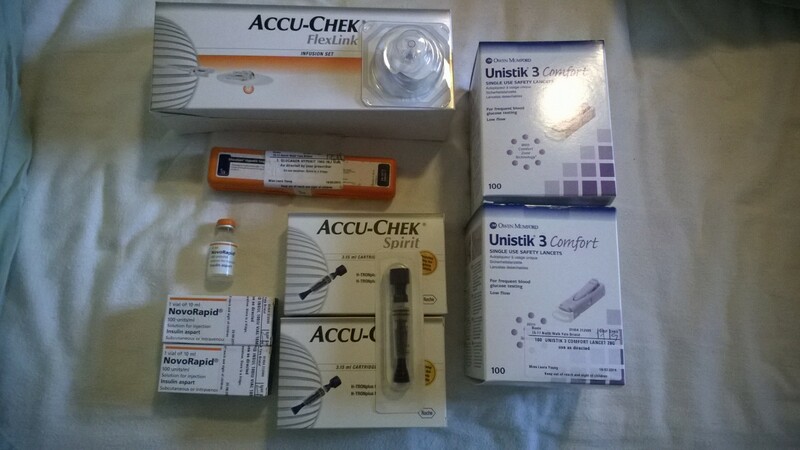 From our bathroom cupboard, a small selection of stock required to keep my diabetic daughter alive – not including the pump, which she wears 24/7. But for now, and for the forseeable future, we’ll keep taking the tablets insulin, and the bathroom in our house will continue to resemble a minor branch of Bootsthe Chemist. And I’ll carry on campaigning. 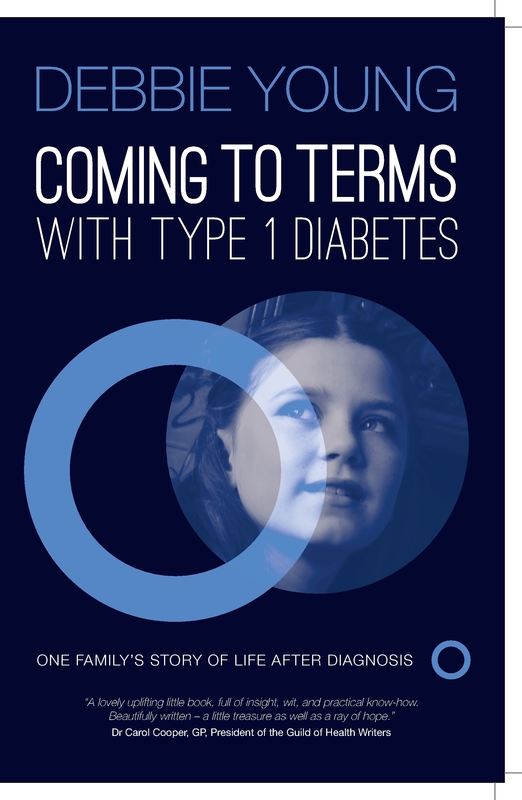 Next month, I’ll be launching the new paperback edition of Coming To Terms With Type 1 Diabetes, with a foreword by Justin Webb. Well, we seekers of truth and reason have to stick together, you know. And The Times really needs to get a grip. If you’d like an invitation to the launch of my book at Foyles, Bristol on 13th November, please contact me to reserve a place. If you’d like to find out more about the great work done by the JDRF, visit http://www.jdrf.org.uk. Oh man, that is irresponsible reporting! I’d also been caught up by the headlines and thought that things were much further along. Thanks for speaking out about this, Debbie. If they can fool you, they can fool anyone, Laura! One of the saddest things about this whole debacle is that this development in research truly is an enormous breakthrough, though not at all a cure, and it is something I ought to be really celebrating. Also very sad is that the lead researcher in this project was motivated by the fact that his own child was diagnosed at a very early age, and always said he would do everything in his power to find a cure, so it’s personally huge for him too. He must also be smarting from the misreporting, which I suspect is global, as friends like you in the States have also been taken in by the headlines. You know I am always looking for hope and a cure 😊 I really wish these stories would increase funding for research- we’ve cut so much research funding in the US and we distrust science so much (that climate changing thingy) that we forget why we support science for the long haul. If it was easy we would have done it. The ironic thing is that the breakthrough that is reported here has only been enabled by investment, including significant charitable funding – yet these ridiculous headlines will certainly make it harder to get funding from those who believe them. 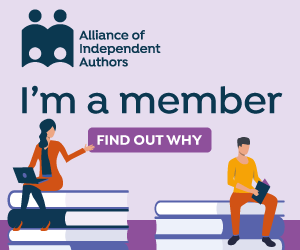 Keep campaigning with your book and spreading the word. Brilliant that you’ve got a foreword by Justin Webb. You’re doing wonderful work, in spite of false rumours of cures. Great post Debbie. Thank you for enlightening me on the subject – you’re right that the papers sensationlise things and in this case it was very misleading. I got my ‘info’ from The Telegraph, so unfortunately it’s not just The Times sensationalising the issue. I’m sure there will be a cure for diabetes one day. It may take a long time to get to that point, but they’re gradually gaining knowledge in the fight to find cures for it and for many other chronic conditions. Although I don’t have diabetes, I’m being treated for a health condition and whilst it’s not life threatening if I stopped taking the medication I would get ill again. So although I’m well, I’m not cured and will probably never be, unless there are major scientific breakthroughs. I can sympathise with your feelings of frustration at the misrepresentation of the facts. But maybe in a roundabout way it will help to shine a spotlight on diabetes and get people thinking and talking about it, which can only be a good thing. Thanks, Clare. By the way, I’ve just been introduced to another novelist who is soon to publish a book with a genetic theme. I have referred him to your book and website to see what you have done and he said he was very interested in your work too. When his book is out, I’ll tell you more. My sympathies, Debbie. I have Type 2, and several friends with Type 1. Mine is just a bore, with a vague threat of nastiness; yours is truly horrible. The press – it goes without saying that I don’t believe any headlines of the “cure found” variety. For them, it sells newspapers; for sufferers, it just adds to the misery. I’ll post a link to this post. Thanks, Henry. I felt so bad having to disillusion my well-meaning friends who thought all our problems were solved. I wish!! Thanks for sharing the link, much appreciated.